Two supercomputers are put in charge of their respective countries' nuclear arsenal. The only way to prevent mutually assured destruction? Take out the other computer before it takes you out. That's the premise for RESISTOR_, a promising looking card game from first time developers Cardboard Fortress. Each turn, you'll take a number of actions in an attempt to make a path of your color from your computer to your opponent's. At any time you've got four cards available to you - the two in your hand and the two in your opponent's. However, since the cards are double sided you can only use what you can see. Each turn you flip over an existing card to change its side, draw a new card and put it in either your opponent's hand or your own, and switch a card you can see from the board to someone's hand. Sometimes the titular resistor cards get played, sending a shock of power that can restore some of your system defenses if played right, and burning out nearby circuits to shrink the available space on the board. It's a tense, tight game of memory and strategy. You want to keep the board moving at your own space while maintaining any advantage you manage to scrape out. Problematically, you have to do all three actions on your turn, even if you don't want to. So if you've got an awesome board set up, where you're at complete advantage, the environment has to change. Sometimes you choose the least bad option, sometimes you just try to make things hard for your opponent to preserve your lead. Sometimes, even, you cut your losses and burn the board down hoping to force a tie and do better next round. In the game I played at PAX Prime, I was able to use a few resistors to lure my opponent off guard, as they'd dropped some of my defenses down and thought they were winning. Then, I turned the tables by healing with a resistor and ending the round on a tie. 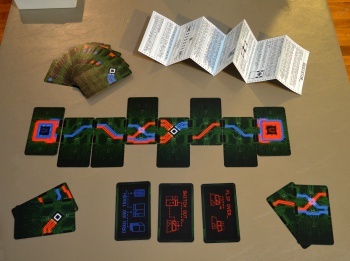 At times the game felt a little too chaotic, and I had to make decisions round to round, but fans of strategy games where randomness is a known factor, or people who love fast, furious card play, will really enjoy RESISTOR_. Developers Cardboard Fortress will bring RESISTOR_ to Kickstarter in early 2015.